Make sure built-up lint doesn’t cause big problems or repairs later. During the winter months – especially if there is a lot of snow – when shoveling, sometimes the dryer vent to the outside gets buried. Make sure to keep the snow build up clear from your outside dryer vent. 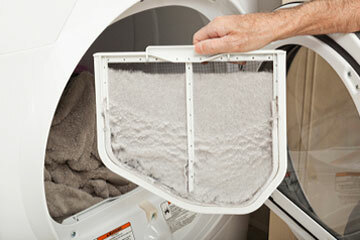 Also if you are not sure about a funny noise your dryer may be making, do NOT put off calling for service. Dryer support wheels or the front glides are much easier and less costly to replace then having to replace the dryer tub or worse yet – having to buy a whole new dryer. Sometimes, by waiting and not calling for service right away, it may cause more damage to your dryer, or end up being a more costly repair. So if something does NOT sound right – pick up the phone and call for service sooner rather than later. It could end up saving you money in the long run.